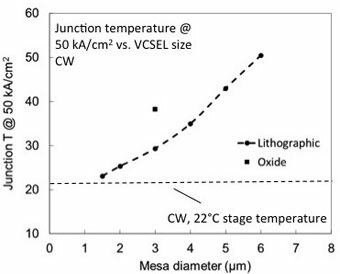 Measurement of junction temperatures for different sizes of lithographic VCSELs using the high heat flow cavity measured at 50 kA/cm2. A commercial oxide VCSEL is also shown for a three micron size. Lasers — Many of the laser diodes sought after performance parameters depend on its operating junction temperature. This is especially true for vertical-cavity surface-emitting lasers (VCSELs). sdPhotonics proprietary VCSEL technologies are based on high heat flow cavities (HFFC) shown to dramatically lower the operating junction temperature. These new cavities eliminate thermal blocks and use enhanced mirror materials for high heat flow to produce record low thermal resistances, and high power. The excellent thermal properties and high temperature performance make them ideal for use in extreme environments.